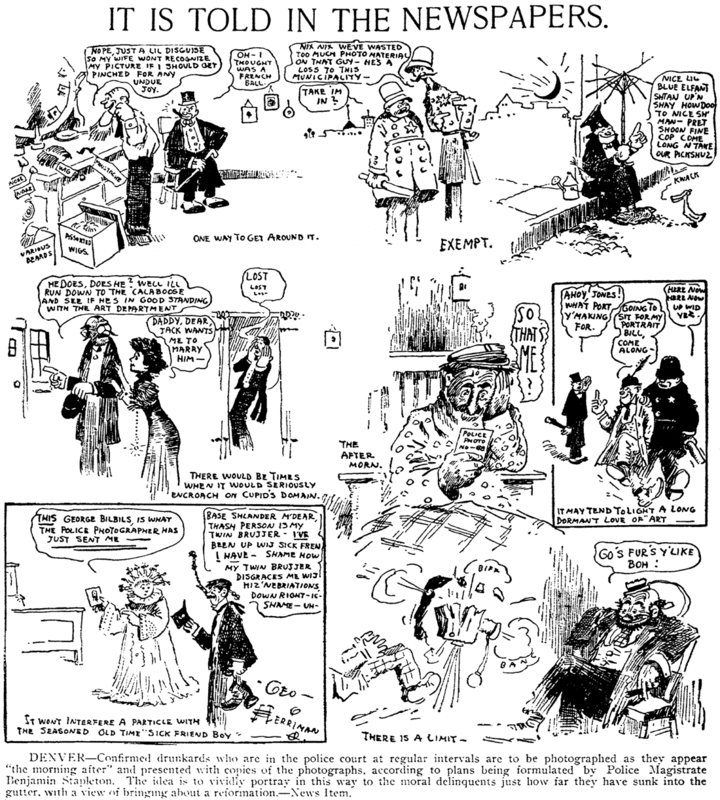 Tuesday, November 26 1907 -- In the oughts and teens, humorous news stories were often accompanied by spot illustrations by a newspaper's resident cartoonist, but this example represents sort of a turnabout. 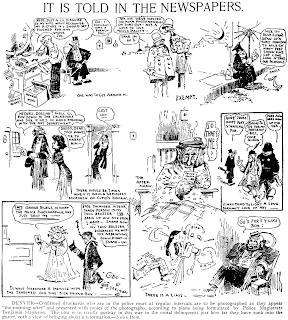 This cartoon appeared on the Examiner's editorial page and the news story gets just a few lines while Herriman's work is presented extravagantly large. When I came upon this one I thought I smelled the birth of a new Herriman series, but that turned out not to be the case. 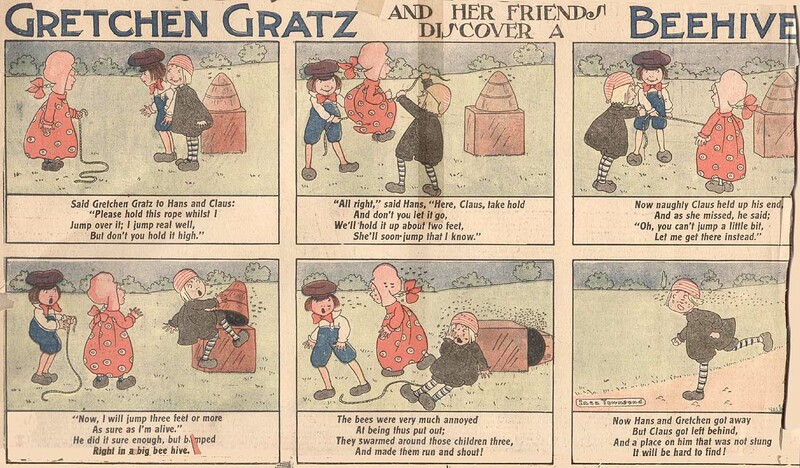 Gretchen Gratz ran in the Philadelphia Inquirer from January 31 1904 to January 8 1905. Inez Townsend was born in England on November 9, 1877, according to the book, Artists in California, 1786-1940. She arrived in the United States in 1891 as recorded in the 1900 and 1920 U.S. Federal Censuses. The May 7, 1899 edition of the Philadelphia Inquirer reported on the exhibitions and prizes at the local fine arts schools. Thursday evening of last week these classes closed. A Spring Garden College website provides a history of the now-closed institution. theoretical knowledge of a classical education…. The 1900 U.S. Federal Census has a John and Clara Townsend and their three children residing in Philadelphia; they arrived in the U.S. in 1889. Living with them were a niece and nephew who had arrived in 1891. The niece's name was recorded as Trey who was born in November 1877, the same month and year as Inez. Trey may have been Inez's nickname. She worked as a clerk in a tea store. Artists in California, 1786-1940 said Inez "began her art career in 1903 on the Philadelphia Tribune and the next year settled in Los Angeles where she did art work for the Times." Her comic strip, "Gretchen Gratz," was published in the Philadelphia Inquirer from January 1904 to January 1905. Under the name Inez Townsend Tribit, she wrote and illustrated "Indignant" (1916) and "The High Cost of Living" (1917) which were published in St. Nicholas, An Illustrated Magazine for Young Folks. She and Hallie M. Swartz copyrighted, in 1917, their musical composition, "'Way Back Home." In 1920 the Tribits were living at the same address and their occupations had not changed. In 1921 Inez wrote "What the Boy Said" which was set to music. The Los Angeles Times reported her husband's death on November 5, 1928; he had been ill for two years. In the 1930 census, Inez was living with her daughter's family. She died in Los Angeles on October 10, 1960, according to Artists in California, 1786-1940. Good work again, Alex! However, they were in error when they said Miss Townsend first worked on the Philadelphia Tribune. The Tribune was and is a Black paper, and I suppose we may reasonably gather that Inez was white. They must have had another Philly paper in mind.---Cole Johnson. 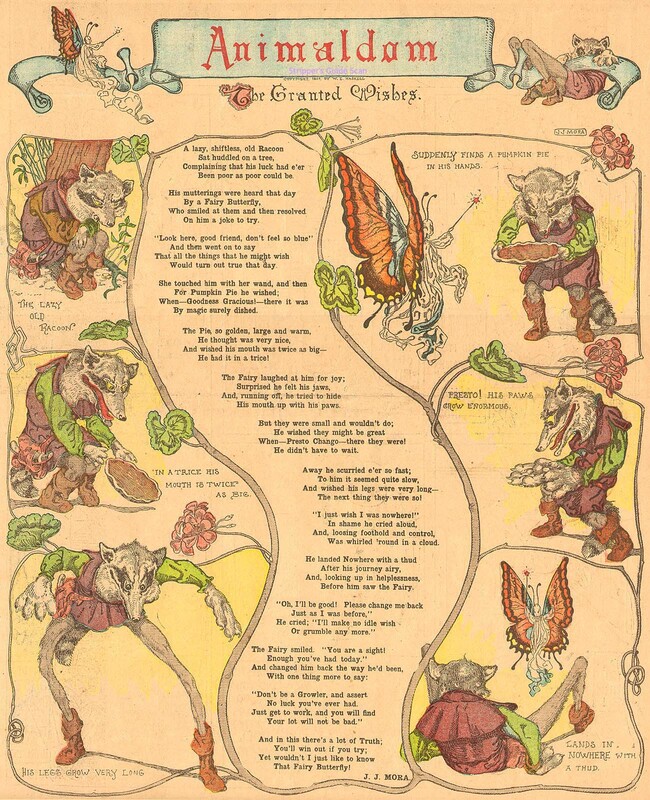 May 4 -- Robert L. Ripley, creator of the daily cartoon "Believe It or Not," signed a long-term contract with King Features Syndicate, Inc., recently. The deal was completed on board the S.S. San Jacinto just before Ripley sailed for Yucatan, where he will gather new material for his cartoon. May 11 -- Feg Murray, cartoonist and sports writer for Metropolitan Newspaper Service, visited Washington this week as representative of the executive committee of the Intercollegiate Association of Amateur Athletes of America to invite President Hoover to attend the track and field championship meet to be held at Franklin Field, Philadelphia, May 31 and June 1. Mr. Murray represents Stanford University, the President's alma mater, on the committee. May 11 -- John Cassel, topical cartoonist for McClure Newspaper Syndicate, will resign and give up syndicate work permanently May 31, he announced this week. He will devote his time to etching and experimental art work. Mr. Cassel has been with McClure since he severed his connection with the New York Evening World in 1927, due to a difference of political opinion concerning Alfred E. Smith's campaign for the Democratic presidential nomination. May 11 -- Jack Wilhelm, creator of "That Certain Party" strip for McClure Newspaper Syndicate, has returned to New York after four months in Hollywood. May 11 -- "Trippy the Pup", a new comic panel by Max Whitson, North Carolina cartoonist, will shortly be placed on the schedule for King Features. 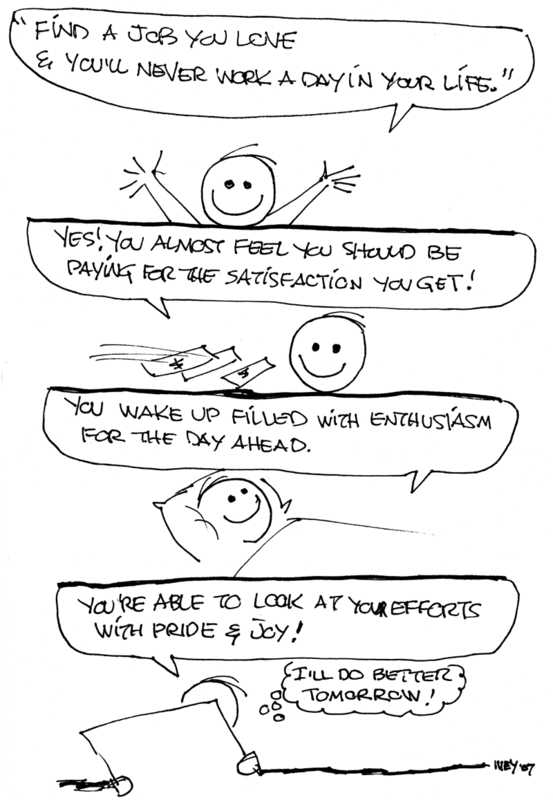 May 11 -- Jimmy Hatlo is doing a new daily comic panel, "They'll Do It Every Time," for the Premier Syndicate. May 25 -- Terry Gilkison, artist, formerly of the Associated Press, has joined Publishers Autocaster Service of New York, for which he will draw a new comic strip entitled "Pinky Dinky." May 25 -- Charles B. Driscoll, who has written many pirate tales, sails next Tuesday for Vigo and other ports in Spain, to do research work on pirates and tresure fleets of the sixteenth century. He will also visit St. Malo, on the French coast, whose French corsairs had headquarters, and will try to find some relics of Sir Fineen O'Driscoll, a noted Irish rover who is one of the writer's ancestors. Mr. Driscoll, editor of McNaught Syndicate, writes a weekly series, "Pirates Ahoy!" and a daily column, "The World and All." I am looking for more information on Max Whitson, from North Carolina and did the the comic Trippy the Pup. He was my great uncle and somehow no one know where his old comics are. I also think he had the comic in one of the magazines of the times and unable to find out that. Any help would be so appreciated. Even though I was young he was still on of a kind and never forgotten. One paper that ran it was the Harrisburg (PA) News. Joseph Jacinto Mora, who worked as Jo Mora and J.J. Mora, was an accomplished artist, sculptor and illustrator who at least once dabbled in newspaper cartooning. 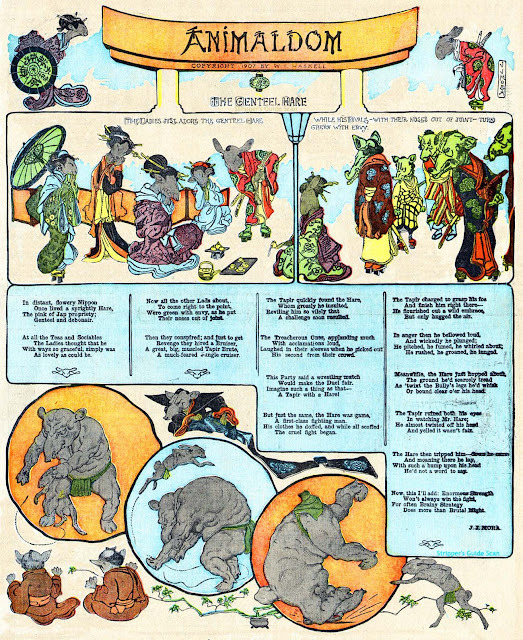 His only documented newspaper series is Animaldom, produced for the Boston Herald from January 13 1907 to January 19 1908. His Wikipedia bio also credits him as working for the Boston Traveler, but I saw no series produced by him there. Mora evidently enjoyed drawing animals, and also produced several children's books featuring his anthropomorphic characters. Seems to me that in this series the vaguely sinister drawings were more likely to produce nightmares for the kiddies than the light entertainment and morals the Herald was probably intending. Mora's artwork is certainly intriguing, but the doggerel verses are downright painful. The comics pages were never a place to expect the next Keats, but Mora's poetry manages to stand out even among the lightweight competition. Dare you to read the two samples above without wincing a few times. An interesting factoid about Animaldom. Mora was originally from Uruguay. 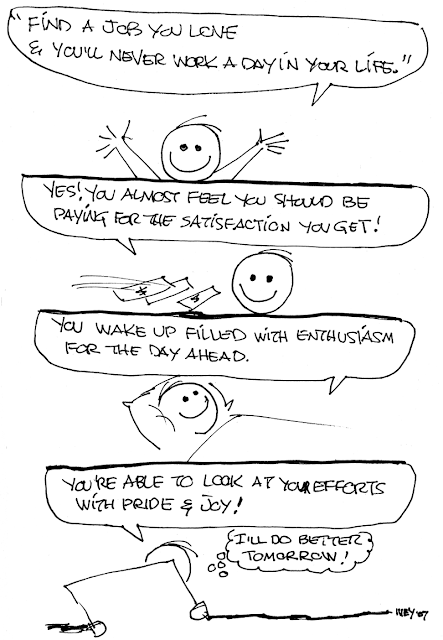 Does this strip then qualify as the first American newspaper comics by a Latino creator? I have to agree on both the doggerel and the dourness of the art. On the other hand, I am impressed not only by the high quality of the illustration but the creative variation in layout and coloring. I'm reminded once again how much effort was once considered reasonable to put in on a single Sunday strip, for both the creator and the reader. noted sculptor, died yesterday after a year's illness. later years he confined himself largely to sculptoring. which has his statue of Bret Hart.